Writer and Black Mamba kicked off our 5 night, Luce Loft extravaganza. Below are some videos from Brad Kester, photos from Carly Ealey and words from Rosey at SDDialedIn.com. Wednesday night kicked off what turned out to be quite a spectacular week of local music. 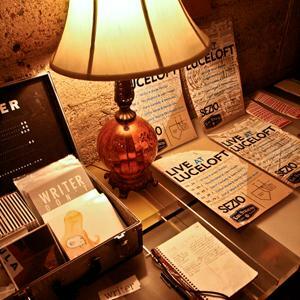 Sezio.org coordinated five nights of music at a place called Luce Loft in downtown San Diego. Sandwiched between Sushi Center for the Arts and The Corner on J Street in East Village, the space is an open loft space with concrete walls, arched wooden ceilings, and open space. It's stunning on its own, but add some couches, a couple giant love sacs, some chairs, area rugs, and 100 people with a deep love for San Diego music and arts, and it was completely breathtaking. And all that before the music even started. Sezio specifically paired bands with different sounds in an effort to cross-pollinate the audiences, and they succeeded above and beyond anything I could've imagined. Black Mamba kicked off the night with a quiet set that set the stage for what would turn out to be ten of the most unique and moving sets of music I've experienced. Aimee's voice is hypnotic and the music allows you to drift away and I was glad that my first time seeing them was in this setting. I look forward to their record release later this month. After a short break, Writer played. It was easily my favorite performance from them yet. It's obvious that their SXSW tour helped David gel with the band. Andy played his guitar unplugged and sang a couple feet back from the mic so it really felt organic. Of all the performances of the week, I think that Writer's lyrics lend themselves to sing-alongs the best, and the crowd took full advantage. right on cash! i think so too, do it again sezio! you guys are great! Hey! Was a great evening! I also "look forard to their record release"
Go to my site http://artvova.webasyst.net/shop/ - I am Waiting for your.